You know when beauty is like a burning pain. Sometimes you feel that pain in your body and soul but realise there is nothing you can do about it. You just need to open all the senses, immerse yourself in the beauty that surrounds us and enjoy it as long as it lasts. 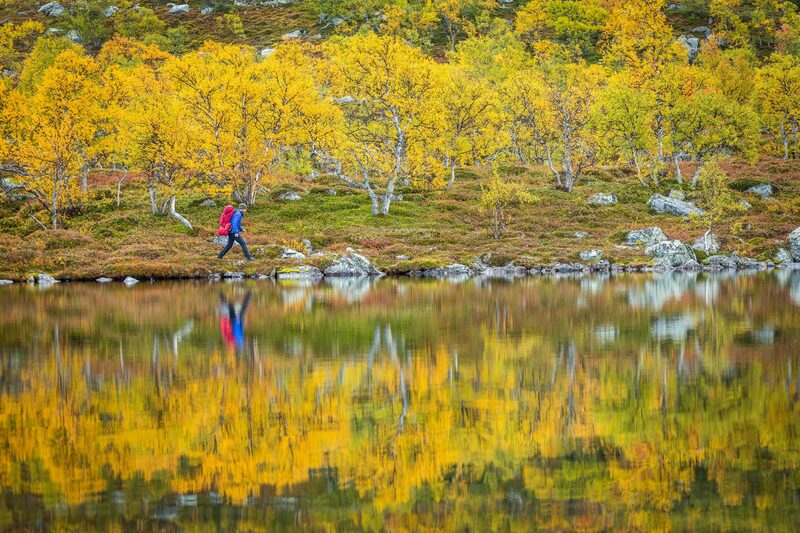 An autumn hike to Lunndörren in the Jämtland mountains is just so painfully beautiful that it is hard to believe it’s true. 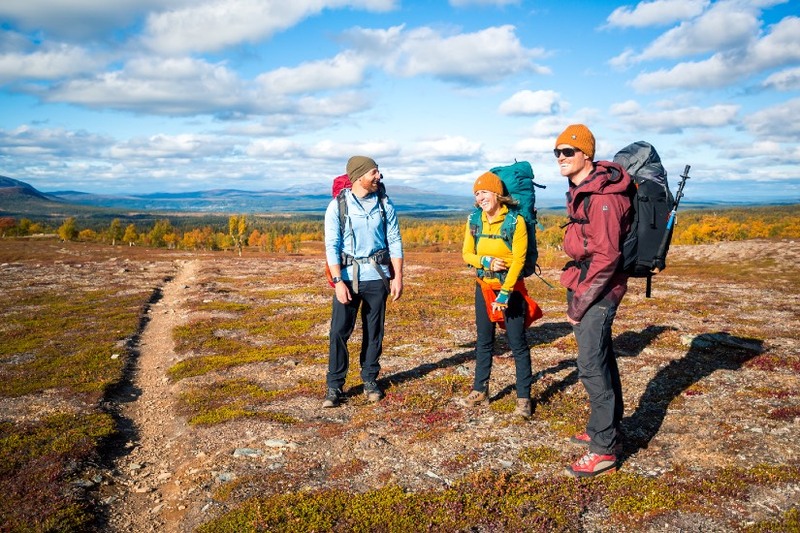 The Lunndörren mountains in western Jämtland can be compared to the more well known trekking area of the “Jämtland Triangel”. 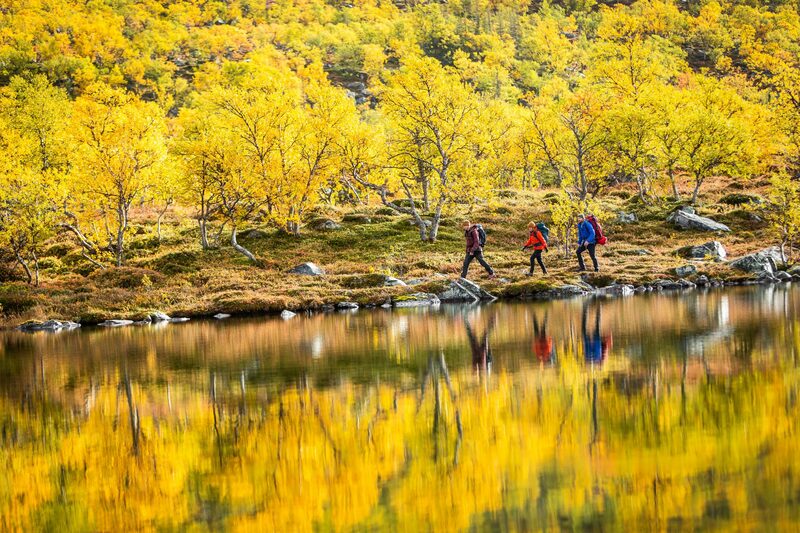 Here you can actually hike what is called the “Vålådalen Square” – a hike between 4 mountain huts. The Lunndörren area is the lesser-known sister and a less visited gem that shines at least as much as its older sister, if not even more. Here, time has slowed down and nature has settled in order for you to enjoy it fully without feeling any stress or pressure. 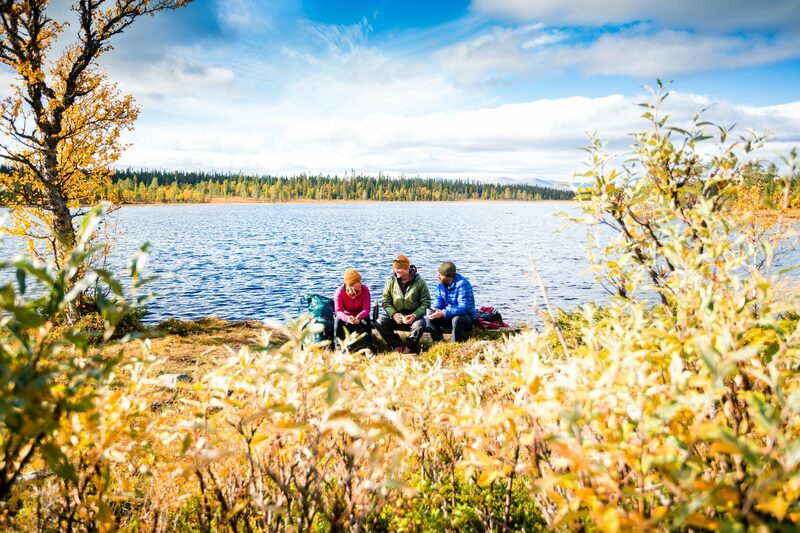 Of course it’s a great idea to hike in summer, wearing only shorts and a t-shirt and feel the sun against our skin but sometimes the experience can be so much stronger when we try a change in approach – like going on an autumn walk in Jämtland. Lunndorrstugan (the Lunndörren mountain cabin) where will be spending the night. At the beginning of the walk, we are met by a dense spruce forest in flat and easy-going terrain. The fallen fir needles creates a soft mat under our hiking boots and the scent of autumn is everywhere. 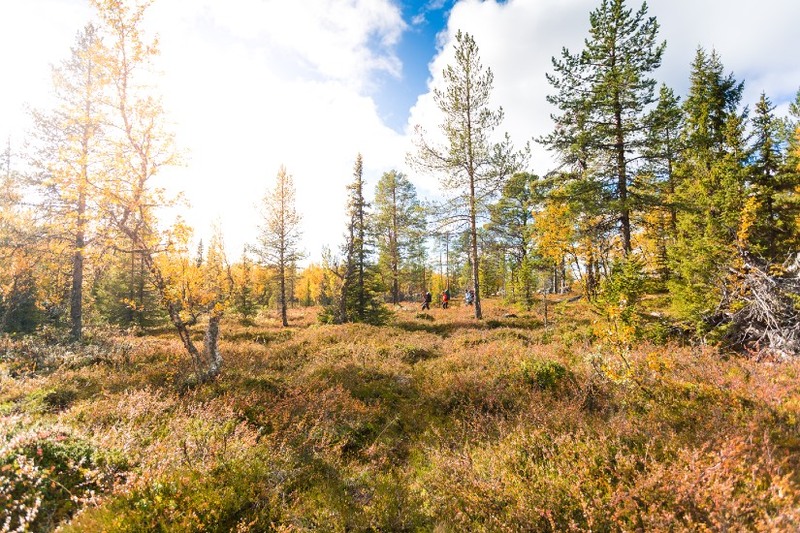 Eventually, the coniferous forest is transformed into a mixed forest with clear elements of birch and other deciduous trees. After about 2 km, the landscape opens up and the vast open space grows and become larger. This is also where the marshes dominate. Now we see an explosion of colors in the forest. It is a palette that changes to yellow, red and brown with strong elements of gold and copper. 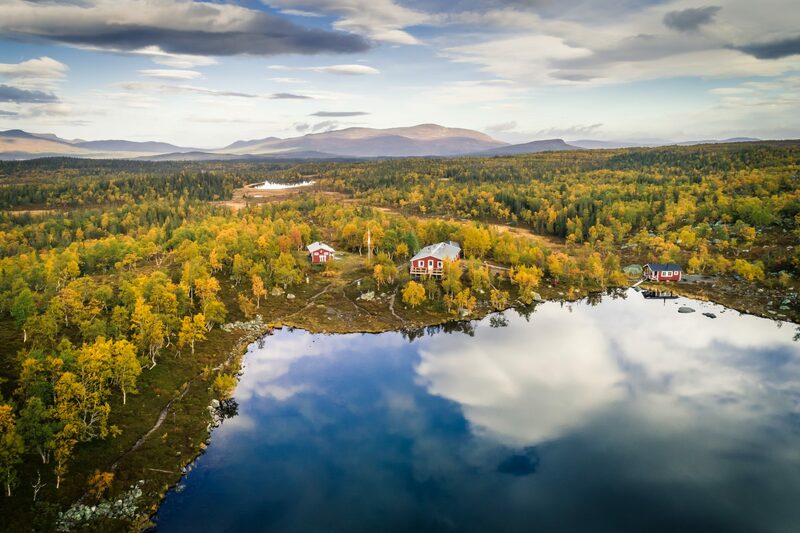 When we arrive at Grönvallen, an old Sami settlement, we see testimony of how the Sami have lived in harmony with nature since ancient times. The houses here blend in well with nature and the connection between human creation and nature’s building materials is both cleverly inventive and beautiful. Of course it is nice to stay here for a coffee break but it is important to make sure that you leave the place in the same condition as you found it in. 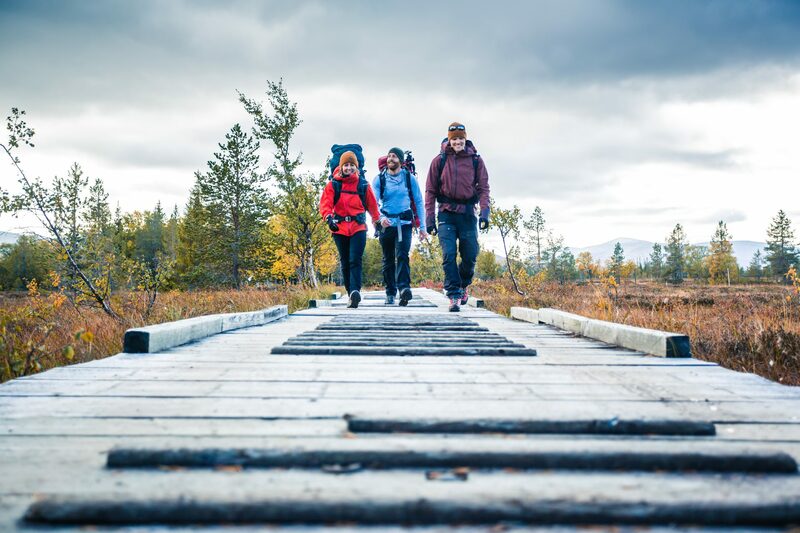 After Grönvallen you have the opportunity to choose between two different hiking trails towards Lunndörren. The more eastern trail is a little longer than the west (both meet up about 3 km before Lunndörrstugan) and this option will lead you past the Pyramids. These are amazing cone shaped natural phenomena, created after the last ice age. An unusual feature in this area which makes them even more exciting. It is forbidden to climb them, so remember to view them only from a distance. Regardless of which path you choose, you always find yourself on land that belongs to the Sami people. This means that you may encounter reindeer during your hike. These fantastic animals should, of course, be respected and viewed from a distance. And don’t forget to keep the dog on a lead. After a couple of hours walking up the mountain on pretty rocky paths and through a rolling landscape, we arrive at Lunndörrstugan (the Lunndörren mountain cabin). We have only met a handful of hikers along the way, so Lunndörrstugan becomes the natural meeting place for hikers who are exploring this area. It is a nice oasis with the most basic facilities you may need. Selfcatering is applied here, so no dinner or breakfast are being served but there is a small shop with various basic foods, snacks and drinks. When it comes to overnight accommodation, the “first come, first served” principle applies. No reservations can be made, but the cabin host will never deny anyone overnight accommodation, which can sometimes give slightly different overnight experiences. It is also possible to camp close to the hut, next to the small mountain lake. Check with the mountain cabin host where it’s most suitable to pitch your tent. The hospitality is felt in every corner and we are experiencing a cozy evening with a sauna and cooking over the open fire. We hear the silence prevailing outside the window and not even the neighbour’s snoring on the other side of the wall can stop us from falling asleep. The morning hours are worth gold. And usually more than that when you are spending time in the mountains. The silence from yesterday can still be felt in the morning and the view of the lake outside the window with the mountain birch’s crackling foliage not only opens the cameras’ shutters, but certainly also some tear ducts. “I feel sorry for the humans,” famous Swedish author August Strindberg said, but right there and then we felt extremely lucky to walk straight out in this magical backdrop. A promising start for our walk back to Vallbo. 12-14 km (one way) depending on trail selection. Vallbo in Undersåkers parish. It is ok to park the car there. STF Lunndörren Mountain Cabin See opening hours here. Yep. There is a dog room where our four-legged friends are welcome. Feel free to ask the cabin host for tips on day trips in the area around Lunndörrstugan. It is well worth spending more time in the area, exploring the surroundings. Make sure you don’t miss out on the sauna next to the mountain lake at Lunndörrstugen.